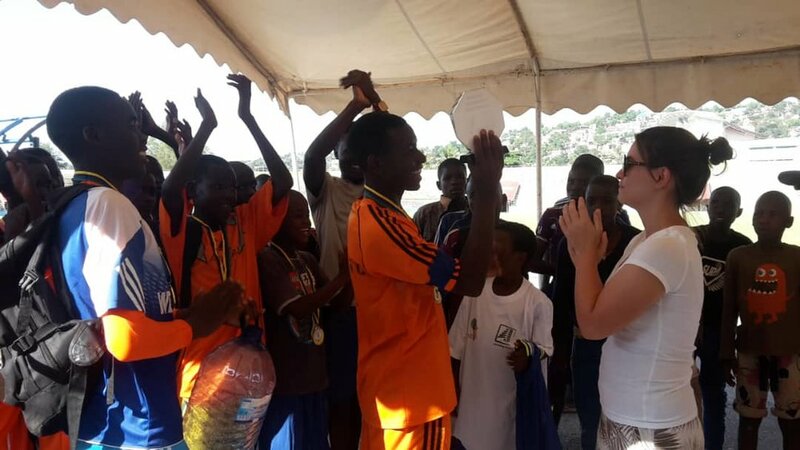 Saturday 30th June saw Kirumba stadium in Mwanza, host five football teams of young people, four of which were from Kamanga and one from the neighbouring town of Geita. For six weeks these young people had been coached in football drills that have helped them explore issues around sexual health and HIV/AIDS testing. The tournament opened with Ash welcoming the young people and their coaches to the first ever Cedar Foundation Championships 2018. “We are here to celebrate your hard work in the TackleAfrica drills these past six weeks and to have fun!” He added. The winners of the tournament were Kosovo FC, coached by our very own Field Officer Abduli. But before the celebrations could fully get under way, Lawrence a medical technician from Kamanga Health Centre, gathered all the players and counseled them about the importance of getting tested for HIV. One by one the young footballers made their way to a room in the stadium grounds that had been especially prepared for the occasion. If you would like to get involved with this Cedar Tanzania project then please feel free to contact us. Please donate here to ensure that our Kamanga TackleAfrica program continues. Thank you.